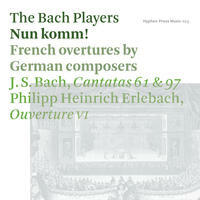 The Bach Players : Nun Komm. Baroque instrumental and vocal gems. Nun komm! explores the form of the French overture in two of Johann Sebastian Bach's cantatas and in a piece by a predecessor: Philipp Heinrich Erlebach. The Bach Players gather their fullest forces to perform the two thrilling cantatas. Interspersed is Isaac's 'Innsbruck, ich muß dich lassen', sung a capella and in two instrumental settings. "... this quite magical disc. Intimate, infused with joy and overflowing with genuine affection, this is music-making which combines enthusiasm and craftsmanship to create something both rare and precious. ... these are performances which stand out from the crowd for their freshness, vitality and sense of total commitment to the music"
"This is an admirable recording: intelligently conceived and well performed. Both cantatas open with a chorus in the shape of a French overture: in no. 61 it's the slow introduction that incorporates phrases of the chorale, whereas in no. 97 the singers don't enter until the Vivace. The Erlebach piece, published in 1693, consists of a French overture followed by the usual suite of dances. The other theme of the disc is Heinrich Isaac's 'Innsbruck ich muß dich lassen', heard as a vocal quartet and as instrumental fantasias by Christian Hollander and Paul Lütkeman; and, lo and behold, it's the very tune that becomes the chorale melody at the beginning and end of 'In allen meinen Taten'. ... Nicolette Moonen plays brilliantly, as she does in the tenor aria of no. 97, with its roulades and double-stopping. Even if you don't like Bach sung one-to-a-part, you can't fail to enjoy these performances." License Baroque instrumental and vocal gems by The Bach Players for your project. Play the music of The Bach Players in your restaurant or store.